For anyone interested in observing variable stars, Mira (formally ο Cet), is a good place to begin. Mira means The Wonderful. It is the first periodic variable star to be recorded. David Fabricius noticed it in 1596: he saw it increase in brightness and then fade away, and assumed that it was a nova, never to be seen again. Then, 15 years later, he spotted it again. Johannes Holwarda studied it systematically in 1638, finding a period of 11 months. Johannes Hevelius, the last astronomer to do significant work without the help of a telescope, named the star Mira in a publication of 1662. Mira remains the most famous long-period variable star, with a period of about 332 days. For around 100 days of each cycle, the object is brighter than magnitude 5. The peak magnitude averages 3.5, with historical limits of 4.9 and 2.0. The minimum ranges from magnitudes 10.1 to 8.6. Brightness increases at twice the rate of its fall. Mira is located close to the ecliptic, in an unremarkable area of the sky below Aries. I began to take an interest in Mira in early August 2012, and discovered that peak brightness occurred late in that very month. Viewing was not convenient: Mira was rising uncomfortably late, although this situation gradually eased with time. However, observation of the peak would be even less convenient the following year, and the next attractive possibility would be 2018, so I decided to grasp the opportunity. Perhaps because of the anti-social observing hours, there was little enthusiasm from members of OASI to join me in making observations. 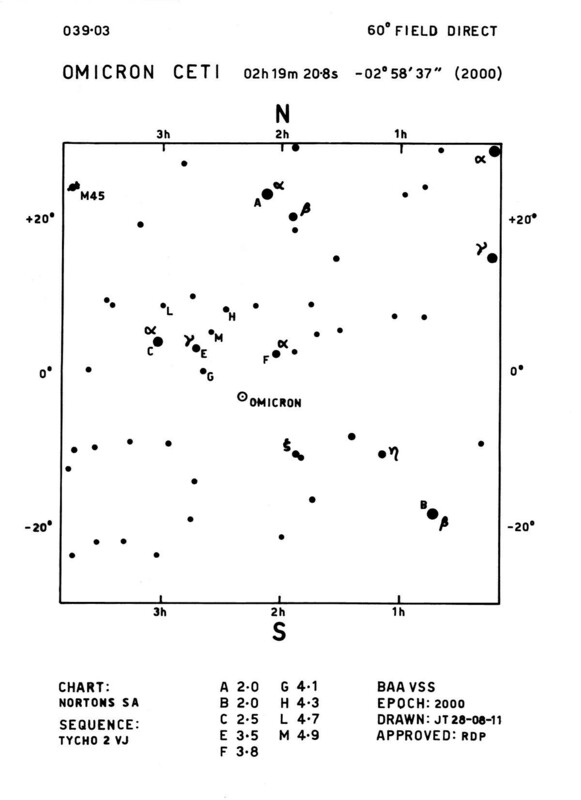 However, OASI member Mike Nicholls, an assiduous observer of variable stars throughout the 1980s, pointed me towards the Variable Star Section (VSS) of the British Astronomical Association. The VSS website, http://www.britastro.org/vss/ is very useful, and provided star maps centred on Mira. Three examples are below, reproduced by permission of the BAA. 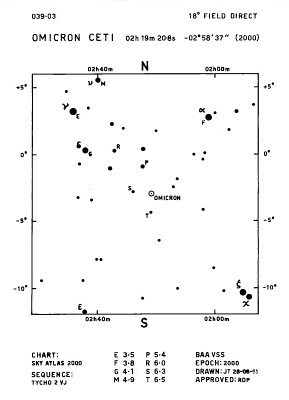 Observers of variable stars use a simple technique. They choose nearby stars of similar magnitude as references, and make comparisons. 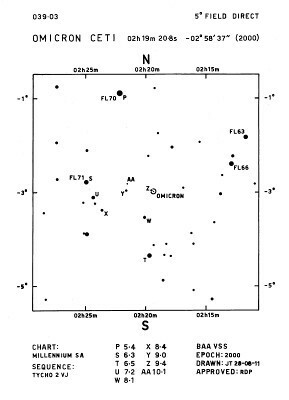 The below maps show star fields with widths of 60°, 18° and 5° centred on Mira. 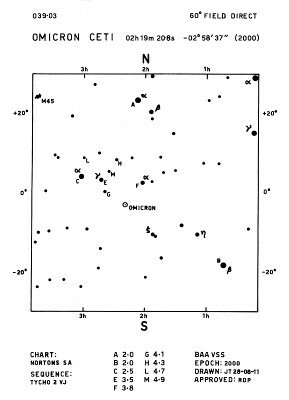 The suggested reference stars, listed with their magnitudes, in the 60° field can be used when Mira is at its brightest. The 18° and 5° field maps suggest reference stars for use when Mira is fainter. Judging the brightness of a red star (like Mira) becomes more difficult if you stare at it. Subjectively, it will appear brighter as time passes. It is better to concentrate on the comparison star, and use fleeting glances towards the target. Needless to say, reference stars should not be red, and should not themselves be variable. Don’t worry about a modest difference in altitude when comparing the brightnesses of two stars. For a beginner, the effect of the difference in atmospheric extinction will be small. Identify the three-star asterism formed by the principal stars of Aries, and use its line to point to the right, going about 7°. This distance is slightly more than the length of the asterism. Find the star η Piscium, at magnitude 3.8. Now turn right through nearly 90°, and head off for that same distance again. Find ο Piscium, at magnitude 4.25. Continue that line the same distance to α Piscium, at magnitude 4.1. Continue the line the same distance again to find Mira – if it is bright enough to be visible. I relied upon the 60° and 18° field maps but did not really need the 5° map, which becomes useful only when Mira falls below magnitude 7. Once Mira passed below naked eye visibility, I tried to continue observations using a borrowed telescope rather than binoculars. Unfortunately, the narrow field of view, and the inverted image, completely flummoxed me. With Mira becoming fainter by the day, I made my final observation in mid-November. Red diamonds - my observations. 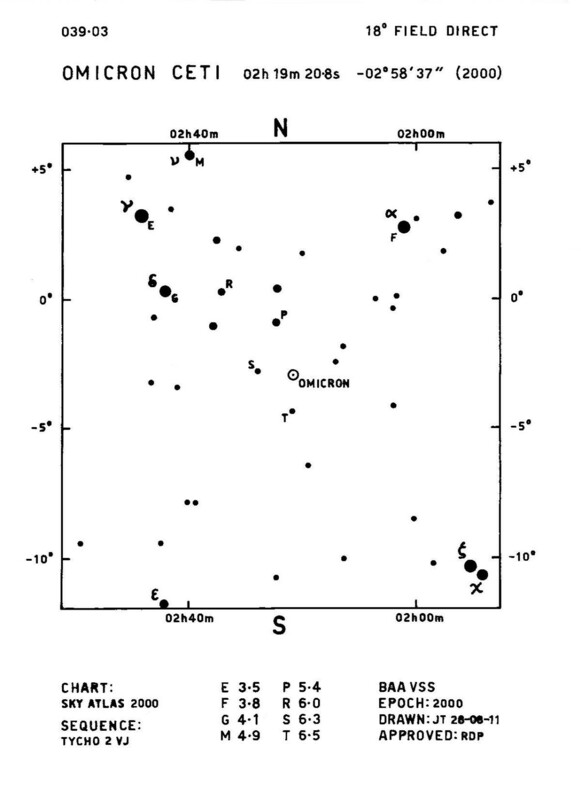 Black dots - estimates from the database of visual observations reported to the AAVSO. The data has been validated, meaning simply that a human has weeded out the more doubtful submissions. Green dots - as black, but using filters calibrated to the "visible" passband. Blue dots - as black, but using filters calibrated to the "blue" passband. My estimates should be compared with the black dots. They lie well within the spread of estimates from other observers. See footnote  for more information on the B and V colour estimates. My speculation in late 2012 that 2018 would provide a good observing opportunity proved correct. At the end of January 2018 I saw a report that Mira had peaked around 29 December 2017. Although I did not begin observing until a month later, I was able to find the star easily using binoculars, using the star-hopping technique that I had learnt in 2012. By late-January, I was able to locate Mira at around 18:30 UT, by which time it was slightly past the meridian and at an altitude of 35°. Its magnitude was between 3.5 and 3.0. Members of OASI attending the OASI@Newbourne meeting on 12 February 2018 saw Mira at low altitude, at about magnitude 3.6. Evidence from the AAVSO is that the current peak is flatter than most, and Mira is now fading, but the real problem for observing is the sunset becoming ever later. What does the future offer? Mira's next cycle will nominally peak on 26 November 2018. At this time, the star will be on the upward side of its light curve and about magnitude 6 early in November 2018. It will be then on the meridian soon after 23:00 UT. The Moon will be after last quarter, and below the horizon, so conditions will be ideal. But bear in mind that it is obviously more difficult to see a star appear out of nowhere than it is to see a star with whose position you are familiar gradually fade to invisibility. 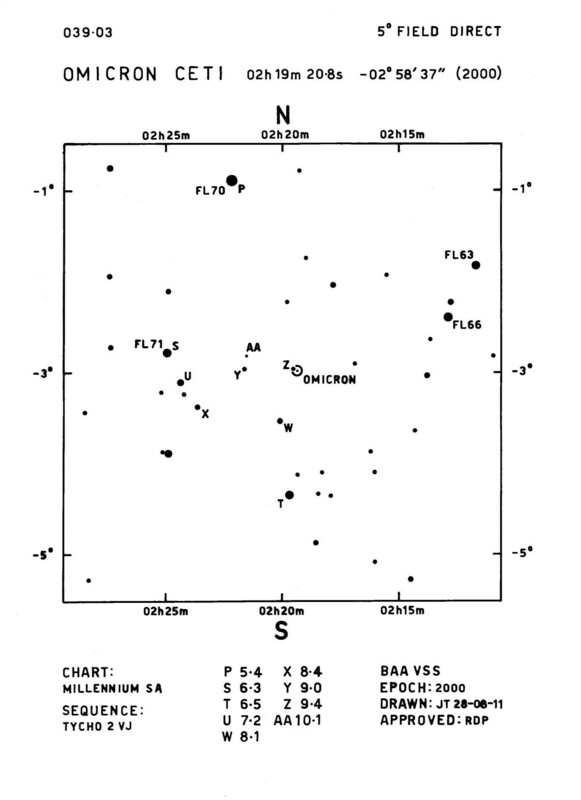 The 5° field chart from the BAA may be useful when using binoculars or a telescope. Mira will subsequently fade to magnitude 7 in late February 2019: at the end of the month, at 19:00 UT it will be in the SW but still at an altitude of over 20°. The Moon will be well out of the way, but the tail end of the observable part of Mira’s cycle may become quite difficult. The following peak occurs nominally on 24 October 2019. This will also provide a favourable opportunity, at least for observers willing to stay out late! Mira will have brightened to magnitude 6 in early October but will not cross the meridian until about 02:00 UT, although it will attain an altitude of over 25° by midnight. Again, the Moon will not be a problem. Observing the downward side of the light curve will become easier and easier. For the final observations, in late January 2020, with Mira at magnitude 7, the Moon will be out of the way and the meridian crossing will be around 18:00 UT, allowing plenty of time for observations before the altitude becomes unsatisfactorily low. So I have made a note in my diary for late October 2018. If you have the slightest interest in observing variable stars, Mira will then provide a great opportunity! Mike’s observations from 1980-81 are available here. Follow the link to his 1986 article on long period variables (LPVs); this explains that the bodies, often described as "Mira variables", are generally old red giants with variability arising from pulsations, whose cause has not been convincingly modelled by astrophysicists. Since 1986, aperture–synthesis imaging in optical and infra-red bands has suggested that many LPVs are not spherical: images show the red giant as a fuzzy blob, looking distinctly oval. To model this adequately requires a super-computer. Mira itself is a binary system. The old red giant is called Mira A, and its companion, Mira B, is a white dwarf which orbits the primary every 400 years or so. Mira B is steadily accreting matter from Mira A, thus the system is an example of a "symbiotic star"; at a distance of approximately 300 light years, it is possibly the closest one to Earth. The difference B-V is the colour index of a star, a quantity which is related directly to its temperature. Sources generally quote the B-V index of Mira as +1.53. The blue and green dots in the AAVSO graph above are consistent with this value. The B-V index implies shows that Mira is red, but not as red as Betelgeuse with a B-V of +1.85, or Herschel’s Garnet Star (μ Cephei) with a B-V of +2.35.